The Occupy movement has found, at last, the heart of the beast. The good news is that it's in the Swiss Alps, with some of the finest skiing in all of Europe just a stone's throw away. The bad news is that instead of tents the Occupiers get igloos. Who knew Davos could be a hardship post? Give me Cleveland any day. "To dismiss the Occupy WEF [i.e., World Economic Forum] movement would be a mistake," an anonymous Davos blogger informs us. Do you hear that, plutocrats? The Wall Street Journal reports that there are 70 billionaires among the 2,500 attendees. 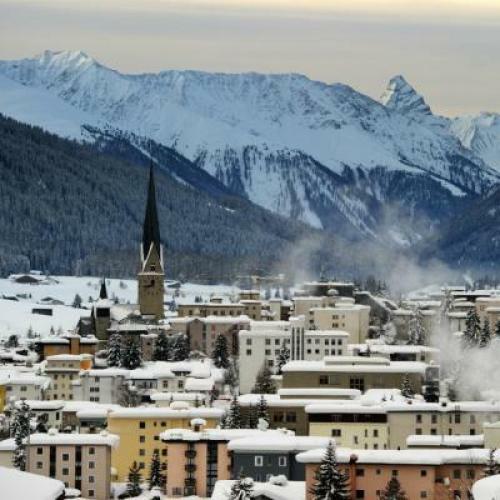 That makes Davos the only place on earth where a billionaire, for a few days anyway, can bust out of the top 1 percent (not to mention the top 0.01 percent). When billionaires represent roughly 3 percent of WEF attendees, that means, arithmetically, that about two-thirds of those billionaires get to slum it for a few days in the bottom 99 percent. What a lark! Sometime in the past--the description on the Davos Web site doesn't say when--there was at least one Davos panel on global inequality. "There are many ways to help reduce inequality," the summary said. First, investment in education will raise the level of skills, which leads to better jobs and hence less inequality. Second, the spread of entrepreneurship and practical business know-how helps to create better jobs and opportunities. Third, governments can empower the population to “climb out” of poverty, form labour organizations and other civil society groups and, more generally, promote democratic political practices. I like that this précis, unlike last night's State of the Union address, mentions labor unions as a path out of income inequality. I wish it also mentioned progressive taxation, which President Obama did manage to work into his address. Maybe one of those frostbitten Occupy WEF protesters will remind them. Meanwhile, I hope that one of the 2,500 WEF attendees can stop cogitating about mankind's fate long enough to send these freezing protesters a samovar filled with hot cocoa. And use the good chocolate, for God's sake. You're in Switzerland. Correction, 4:20 p.m.: The original version of this blog post said that the inequality panel described above was scheduled for today, Jan. 25. But since the description says "Friday, Jan. 25" it must have been held some other year. I blame the New York Times for running a story today headlined "At Davos, A Big Issue Is the Have-Lots vs. the Have-Nots." Skimming this piece leaves one with the strong impression that inequality is on the Davos agenda this year. But read the piece closely and you will discover that it contains no evidence whatsoever that inequality is being discussed at Davos--none at all! It's a total con job, and I got taken in. Incidentally, the competition is fierce, among panels that really are being held this year, for the one with the most risibly Davos-like name. "Global Risks 2012: The Safety of Our Safeguards" is a strong contender, as is "The New Context For Leadership." But I have to go with "Managing Complexity With The Santa Fe Institute." It combines a deeply serious tone with a total absence of discernible content; unsubtle institutional branding; and the gravest possible risk that attendees will perish from boredom. This is what you get when the best minds and/or fattest wallets assemble to congratulate one another for being on top.